According to data from the U.S Census bureau, there are approximately 76.4 million baby boomers living in the United States today. Contrary to what many think, there are very different segments within this generation, and one piece that sets them apart are their housing needs. What are ‘second-wave baby boomers’ looking for? In a homebuyer study performed by The Farnsworth Group, the participants revealed their reasons for purchasing a new home. 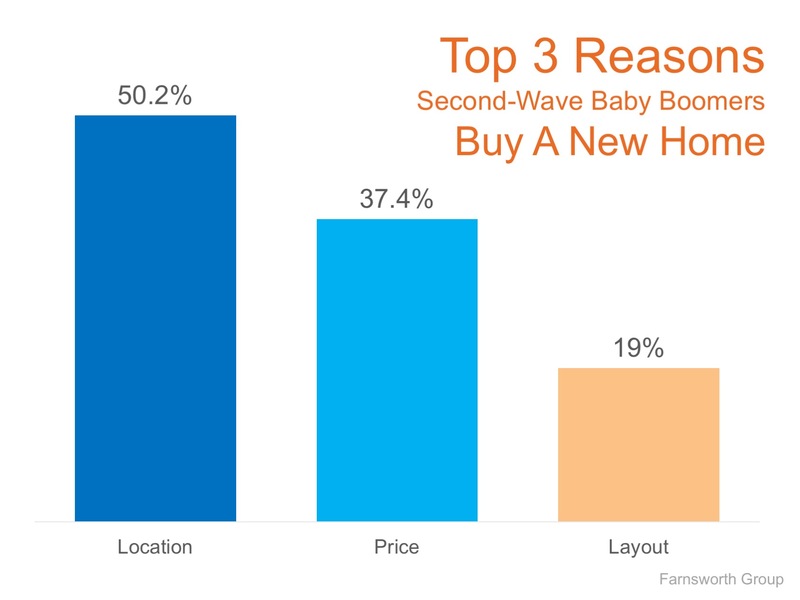 The top three factors that influence their purchase include area/location (50.2%), price/affordability (37.4%), and the layout of the home (19%) (as shown in the graph below). The report also found that when buying a new home, there were other concerns like quality of construction (9%), a safer neighborhood (8.4%), better floor plans (8.25%). The most important rooms or areas are the kitchen (82.8%), master bedroom (59.2%), and great room (36%). Technology also plays an important role! Second-wave baby boomers prefer wireless security systems (7.1%), lighting that senses and adapts to them (6.3%) and integrated home technology, including “smart” thermostats and lighting controlled by a smartphone (6.2%). 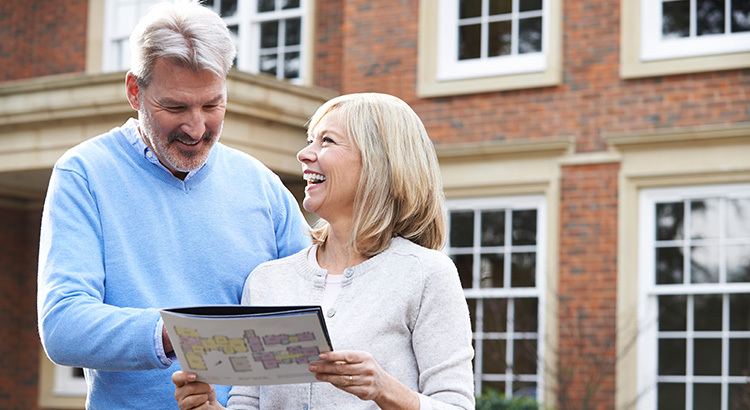 If you are one of the many ‘second-wave’ baby boomers who is starting to feel like their current homes no longer fit their needs, take advantage of the low inventory of existing homes in today’s market by selling your current home and moving on to one that truly fits your new lifestyle. Steve comes to the world of real estate with nearly 30 years of Marketing and Graphic Design experience. These two very important skills make him ideal for this profession. In 2017 he achieved his highest accolade to date becoming a global, award-winning real estate graphic design/marketing recipient. Mr. Baker is not only a REALTOR but the Director of Marketing for Rinehart Realty. His education and work experience also include a Bachelor degree in Education and degrees in Radiologic Technology and Medical Ultrasonography. He was a pioneer in the field of Radiology PACS development and Radiology Voice Recognition adoption and implementation in southwest Virginia. His previous positions as Director of Radiology and PACS Administrator lead to enormous development in resources and project management necessary to succeed in the field of real estate. Steve is a writer and developer for a variety of blogs and real estate publications. He recently completed his first book of quotations and is currently working on a Real Estate Marketing book. He is a strong supporter of the United Way, having won a past Campaign Coordinator of the Year award. He is also a strong advocate for breast cancer research and education. Mr. Baker has a history of work experience developed on the foundation of a strong work ethic, the pursuit of excellence, quality, honesty and integrity. The data relating to real estate on this Web site derive in part from the Carolina Multiple Listing Services, Inc. IDX program. Brokers make an effort to deliver accurate information, but buyers should independently verify any information on which they will rely in a transaction. All properties are subject to prior sale, change or withdrawal. Neither Rinehart Realty Corporation nor any listing broker shall be responsible for any typographical errors, misinformation, or misprints, and they shall be held totally harmless from any damages arising from reliance upon this data. This data is provided exclusively for consumers' personal, non-commercial use and may not be used for any purpose other than to identify prospective properties they may be interested in purchasing. © 2019 Carolina Multiple Listing Services, Inc. Data last updated 2019-04-23T09:58:50.477. © 2019 Piedmont Regional Multiple Listing Service, Inc. All rights reserved. IDX information is provided exclusively for consumers' personal, non-commercial use and may not be used for any purpose other than to identify prospective properties consumers may be interested in purchasing. Information is deemed reliable but is not guaranteed accurate by the MLS or Rinehart Realty Corporation. Data last updated: 2019-04-23T10:55:41.967.